If I ever made a list of my favorite comic artitsts, one name in the top five would have to be Jiro Taniguchi. He's an older generation mangaka whose work has enjoyed more exposure in the west over the past 10 years or so, thanks to publishers Fanfare/Ponent Mon. They've translated and released several of his works in that time. I've read many of them, and while I don't find all of his stuff interesting at first glance, his style and sense of pace always guarantee I'll give it a try. 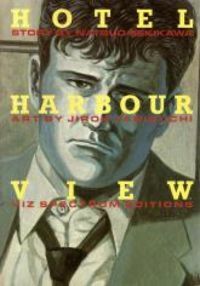 The first time I saw his work was in a collection called Hotel Harbor View. It was a heavily noir story, with violent and sexual overtones that first appeared more than 20 years ago. It was an example of extremely decompressed artwork, where short bursts of action are depicted over many panels. The story's long been out of print. I was only able to find an old copy at a comic shop I used to frequent. I still have it somewhere in my stack of long boxes in the spare bedroom. Taniguchi's style was so clean and polished, thoroughly devoid of the manga cliches you can find in so much other work, and yet still retained an unmistakable manga flavor. I've kept up with much of his work released here in the states, and his latest comes this week from the same publisher. It's called A Zoo In Winter. The story is more of an autobiographical piece, concerning the early days in manga of a young artist named Hamaguchi. He travels to Tokyo in 1967 to become an apprentice to a famous manga artist of the time, helping to draw backgrounds and fills. Ultimately, it's not satisfying work, and he begins to think of doing his own manga. His friends try their best to encourage him, but Hamaguchi's real inspiration, his muse, comes in the form of a young woman he's introduced to who suffers from severe health issues. Their meetings and conversations jump start his imagination, and before long he's making progress on his first original story. Complications ensue, however, and he finds that he must draw more inspiration from within rather than always relying on his meetings with Mariko. The couple fall in love, but it's not a conventional romance by any means. Her health becomes an impediment to any further deepening of the relationship, but the ending doesn't give away what happens beyond that first year together. Perhaps Taniguchi is planning more installments. This story was one of the artist's more recent efforts. It was published in Japan in 2008. It's much more of a contemplative character study, similar to The Walking Man, an earlier production. The Walking Man was really no more than the story of a man as he walked through his neighborhood, and the mundane events that occurred. It sounds stupefyingly boring, but the man's art and pacing made it an engrossing, meditative journey. I still think it's one of his best. I enjoyed this effort, though I do find myself missing his more action-oriented work, like Benkei in New York, and Hotel Harbor View. The man is much older now, well into his 60s, but his artwork is still near his peak. He probably won't continue to produce much new work in the future, but I still think about what undiscovered gems are yet to be brought over.